A big THANK YOU to Fashion & Style Guru from http://fashionstyleguru.wordpress.com/ for the nomination. It means a lot to me to receive 2 great awards from the awesome Gurus’ of Fashion & Style. Leave a comment on each of the blogs letting them know they’ve been nominated. 3. I love Fashion and drools at all the unique designs that I wish I can one day afford. I hope to meet more aspiring fashion designers and get the chance to see their creations and know more about their brands/visions. 4. I’m very hands-on and enjoy designing and DIY-ing stuffs for my friends. 5. I cannot tolerate bad customers service and will not hesitate to give my 2cents worth. 7. At 19-20yrs old, I decided to have a nose ring and had it pierced twice cos the 1st one dropped one day later while I was sleeping! What an honor!!! Thank you So much for these nominations…we graciously accept them and will pass it forward <3 xoxo ~ http://www.tresorseluxe.wordpress.com! So do you!!! We always love visting you and your fantastic blog 🙂 xoxo Thank you again sweetie!!! Thank you so much! 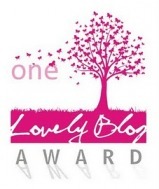 It’s so super sweet of you to nominate my little blog.